garygid wrote: I suggest that PERHAPS the GID/2 (0 to 140.5) is an estimate of the remaining USABLE pack voltage (about 394v full and 254v "exhausted"). I will have to do some graphing of some logs to see if that scaling and "meaning" works. However, I believe that the TRUE low limit for the Pack really should be based upon the voltage of the lowest cell-pair, NOT on the Pack Voltage (to avoid damage to that lowest cell-pair). Yes, the chief engineer did mention that they measure 96 voltages, and that the lowest / highest was part of the equation, as we know it has to be. Much of this conversation, as previously posted, then centered around how many variables that they monitored to come up with DTE. To that end, Nissan IT folks were working on including elevation with the mapping and navigation equation. I think they are working toward the only possible solution that is possible to determine the most pertinent variables to calculate range. linkim wrote: Also, one of our local LEAF owners generously provided the Nissan Japan visitors a gift from California that will require them to check their luggage at the airport (assuming it is not gone before they leave). Judging from what the younger engineers said, I don't think it was going to make it through the night without being consumed. I gave them 8 bottles of wine. In my dealings with Japanese folks (in my first job), it is very important to exchange gifts. Notice that they gave us all LEAF hot wheels. My second job is winemaker at Villa del Monte winery in the Santa Cruz mountains. We are a VERY small family-owned winery that specializes in Santa Cruz Mountains wines. We are only open one weekend each month and this coming weekend is it (10th & 11th). We have 6-20 and 14-30 outlets so, bring your modified EVSEs and taste our wine. 6.5 kW PV, making ~24 kWh per day (average). Here is a crack at the complexity of challenges the Nissan algorithm programmers have to rise to. Here are my notes on the Leaf SOC as presented, plaease excuse my lose interpetation of the information. Seems more like a dark art than math based on quantifiable scientific information. Waring read at your own risk of being even more confused when you get to the last part. Basic process of Nissan on how they estimate SOC. Difficult to estimate during charging/discharging. Cannot measure OCV with load. Estimate OCV from V and i during driving time line. End of driving again difficult to estimate. Just after charging/discharging. cannot measure OCV with influence of chemical reaction in battery. Adjustment of estimate SOC value is adjusted to match vehicle behavior "Mysterious moves" occures in some scene. Full charging stops at MAX SOC 192 Cells. Decending Cell of average estimated value (2*) Correction of estimate tolerances cause by sensore, cell tolerance etc. Decending Cell of minimum tolerance. Estimate e.g. (2*) this decends but then assends briefly then desends back down to empty. Empty___________________________Judge empty at Min SOC. Here I give extremly brief notes about the 12 segment SOC meter. SOC sharp drop cannot be recognized between the 6th & 4th segments (example shows). Basically a series of calculated corrections are done so in summary to prevent an overestimate SOC. Increase risk of empty. SOC becomes "0" (I believe its below the segment) with some energy. This is to Reduce risk of empty. Energy consumption ratio could be more varible factor than SOC. Changed by Acceleration, Regen, Climae Ctrl, Gradient etc. If it sounds confusing that's because it is, we do not have the complete picture. Blue LEAF In service since 03/08/11 Plate "IM N EV"
Interesting. It's easy to fall into thinking of the battery as some idealized "energy balloon" that simply inflates and deflates, rather than what it really is -- dozens of cans of highly reactive chemicals that do what we want only to a certain degree, and then only within certain parameters. It's good to appreciate the strides in the state of the art that have made a car like LEAF possible. And good to know that there's still significant room for improvement. While a lot of this has been driven by portable electronics market in the last 20 years, there is nothing on earth to compare to the automotive market in driving practical improvements. Now that EVs are becoming part of that stream, the next decade is going to be very interesting. JohnOver wrote: That was me Kim. Thanks JohnOver for your generous contribution to the meeting with the 8 bottles of wine for our Japanese visitors. We had several discussions over what to give to the Japanese. I think the wine is an excellent choice - a truly California product, and produced by a LEAF owner. We intentionally played down the presentation of the wine (sorry JohnOver) at the end of the meeting because the Nissan visitors from the US/UK did not receive any gift from us. The gifts may not make it to Japan, but the spirit will. 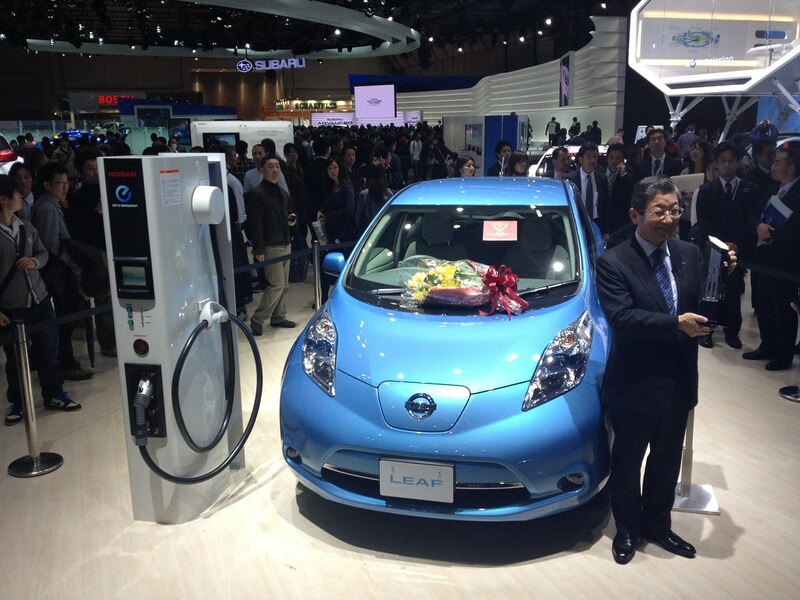 edatoakrun wrote: Any discussion of how Nissan can assist in US DC Charge infrastructure development? They have helped by making less expensive hardware, and CHAdeMO chargers are finally getting their UL approvals. ... but California is a bit of a mess right now. Understatement of the thread, IMO. My house was without power for several days recently, and my Leaf had plenty of charge. I sure do wish I could have used it to have some lights. I drove it every day anyway, as Burbank just opened some L2 chargers and I was headed there anyway. I assume that is what you mean by V2H. Really would have made me the envy of the neighborhood if that was an option. wildcatzoo.org drive there on Sunday across a big mountain, sorry no public charging at this time.